When it comes to cybercrime and the HPE NonStop, hacking a system is about finding a way to access privileged userids such as super.super, or the application owner, which enables a person to then perform unauthorized functions on the system as that user. The only way to ensure that there are no holes in your security that would allow this kind of breach is by regularly reviewing all of the subsystems that, if not configured appropriately, may leave your company exposed. 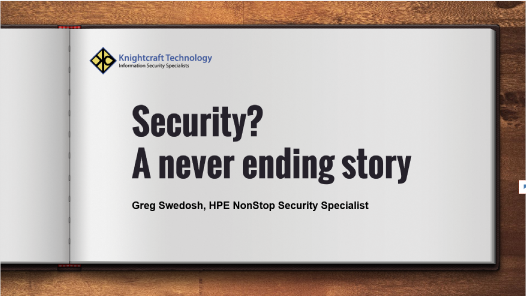 This presentation provides a structured approach to performing a security review of your HPE NonStop environment. This presentation was delivered at the 2016 HPE NonStop Advanced Technical Boot Camp. *Knightcraft Technology is the leader in security consultancy services and PCI DSS compliance for the HPE NonStop Server platform. With a proven methodology and toolset, and our partnership with comForte, wherever you are located in the world, we can assist you. Please see the Knightcraft Services offering or contact us to find out how we can help you ensure that your HP NonStop Server security, audit and compliance requirements are fully satisfied. Knightcraft services can be obtained directly from Knightcraft or can be procured through either of our partners, HPE or comForte. Please Contact us or your HPE or comForte account team to find out how we can help you achieve your security and compliance objectives.